Custom patio umbrella manufactured from a heavy-duty reinforced aluminium frame with a premium 600D oxford polyester canopy. Emblazoned with your graphics over the entire canopy. These are perfect for big branding at events and functions. Contact us today for a free virtual sample and a no obligation quote. Are you looking for the perfect way to advertise and promote your brand outdoors? Do you run a coffee shop, restaurant, kiosk, or anything else that means your customers might sit outside? Then our custom printed patio umbrellas are ideal! They come in a range of different sizes and print options to suit every possible circumstance, and all our umbrellas are manufactured from aluminium with a 23 kg weighted plate base which stops them flying away even in the most adverse weather conditions. 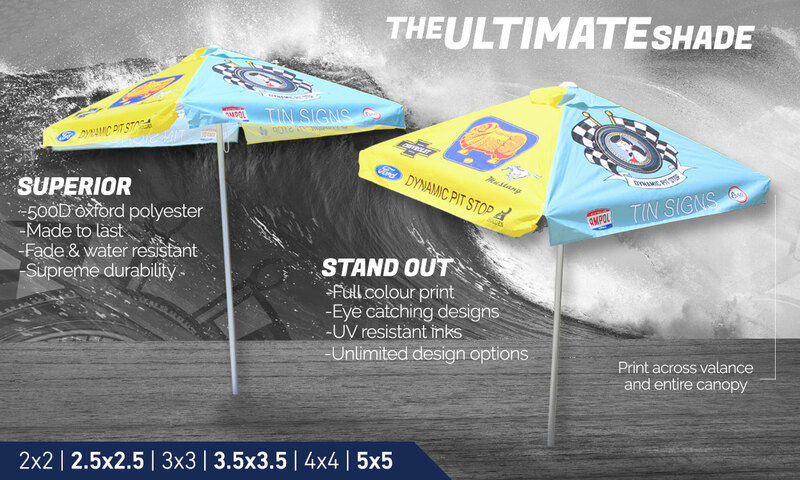 Our team can print anything on your umbrellas, and so they are perfect for general brand awareness or even specific promotions and campaigns. All you have to do is contact us using the details provided on this site, and our staff will provide advice and recommendations based on your ideas. We will work with you to come up with the perfect umbrella designs that will help your storefront stand out from the crowd and ensure you get a lot of attention. We sell our custom printed patio umbrellas wholesales to businesses, and that helps to keep the costs down for everyone. We understand that marketing budgets are often tight, and so we do everything within our power to create savings that we can pass on to our customers and clients. Indeed, that is why we offer some of the best prices in the industry today, and you’ll struggle to find a better deal elsewhere. We provide a free design service to all customers and clients, and we promise to beat any like for like quotes you might obtain from our competitors. Once you review the final design and let us begin; we will start production the same day to ensure you get your umbrellas as quickly as possible. We can include images, logos, slogans, or whatever you like. In large cities and towns where there are lots of coffee shops and restaurants; entrepreneurs have to think outside of the box to ensure they stand apart from their competition. 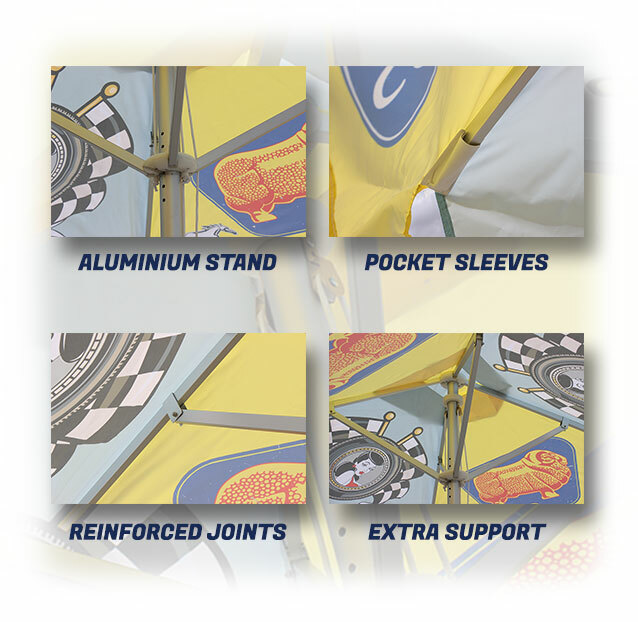 Our custom printed patio umbrellas will help you to do that in a fun and affordable manner. So, what’s holding you back? Contact our team today and start the ball rolling. With heavy-duty reinforced aluminium frames and premium 600D oxford polyester canopies; you aren’t going to find more durable and robust umbrellas anywhere else. That is why we have built such a fantastic reputation in recent times. No matter how unusual or innovative your ideas might be; our team will help to turn them into a reality and ensure you benefit from a storefront advertising solution that consumers will never manage to ignore. We provide free virtual samples to all customers and clients to ensure you understand precisely how the finished products will look before we begin production. We also give you lots of opportunities to raise any concerns or make alterations during the design stage. Contact us today and start a discussion about our custom printed patio umbrellas. You’ll blow your competitors out of the water and draw more customers into your premises than ever before. Don’t believe us? Try our umbrellas out for yourself!